For the 2014 AGYU Is Toronto Burning? exhibition, I compiled and the gallery produced two in-house publications (design and production by Michael Maranada). One collected, as much as I could find, documents on the period in Toronto and articles on or by the exhibiting artists (and includes dossiers on the A Space "coup," the CEAC controversy, and the Body Politic raid). 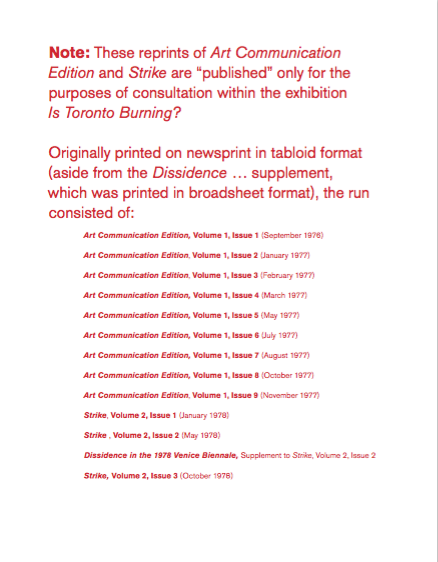 The other compiled the complete run of the Centre for Experimental Art and Communication's (CEAC) publication Art Communication Edition (9 issues) that was then renamed as Strike (3 issues). Both publications were complied from documents and magazines in my own archive.